PHILADELPHIA, Jan. 12 /CSRwire/ - /PRNewswire/ - Today, Mayor Michael A. Nutter and IBM (NYSE: IBM) announced a partnered effort to support workforce development by increasing the accessibility and functionality of the Digital On-Ramps initiative, a City-wide collaborative aimed at providing "anytime, anywhere" learning and workforce training to Philadelphians. "In order for Philadelphia to be a 21st century work-ready city, our workers need to be better prepared, educated, and trained. Our partnership with IBM is an important first step in furthering existing initiatives and developing new solutions to improve workforce development," said Mayor Nutter. "IBM has essentially created a roadmap to guide our Administration's continuing efforts to build workforce development and education using digital technology." As part of its Smarter Cities Challenge grant to Philadelphia, IBM specialists compiled a report on the state of workforce development of the City through interviews with city officials, employees, and non-profit leaders. The findings have been assembled into a list of recommendations that the City of Philadelphia can use to improve the Digital On-Ramps initiative. IBM also donated educational software and hardware to the City to help students improve reading, language, math, and science skills. The value of IBM's donations to the City, including the Smarter Cities Challenge grant-funded recommendations, total more than $1 million. Providing them with up-to-date information on how to access in-person skills training programs and other resources. The new Digital On-Ramps model will utilize non-profit organizations, public and private partners to combat the growing disparity between workers skills and available jobs in Philadelphia. Over a four-year period, Digital On-Ramps aims to serve the 175,000 youth and adults already enrolled in the Philadelphia learning community. "Philadelphia is making an important effort to close the gap between skills and jobs and it's doing it in the right way – in a partnership that brings the private and public sectors together," said Stanley S. Litow, IBM's Vice President of Corporate Citizenship and Corporate Affairs and President, IBM International Foundation. "We look forward to continuing to partner with the city to help produce a more educated, employable, and prosperous citizenry." In addition, IBM announced it would donate Reading Companion software to be installed on computers in 19 area recreation centers. Reading Companion employs voice recognition to listen and provide feedback to users to help them improve their reading skills. 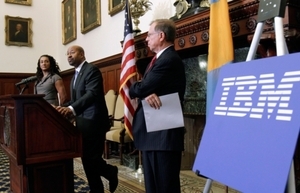 IBM is also donating 100 Young Explorer learning computers to the Greater Philadelphia Urban Affairs Coalition. The Young Explorer learning computers will be used at several Freedom Rings public computer centers to help young children learn math, science and language arts concepts to better prepare them to succeed in school. The IBM Smarter Cities Challenge is a competitive grant program in which IBM is awarding $50 million worth of technology and services to 100 municipalities worldwide through 2013. Teams of specially selected IBM experts provide city leaders with analysis and recommendations to support successful growth, better delivery of municipal services, more citizen engagement, and improved efficiency under the Smarter Cities Challenge grant. An overview of IBM's work in Philadelphia can be viewed here: www.youtube.com/watch?v=vG2UH9o7UYU. To read a conversation with the IBM consultants who worked with Philadelphia, please visit http://ibm.co/y2Dhcz. For more information about IBM's Smarter Cities Challenge grant program, please visit www.smartercitieschallenge.org. Follow Citizen IBM on Twitter at @CitizenIBM and on the Web at www.citizenibm.com.